A friend sent me a link to drop-dead gorgeous cupcakes (30 of them!) and thankfully the pictures were accompanied by recipes. The baker-writer has done a fabulous job, even though she claims to have never baked before, her cupcakes look like they belong in a cupcake shop. Her generous effort of cataloging 30 of the best recipes from friends and family is truly commendable. You must stop by here, even if to only indulge in visual gluttony of Ming’s creations. 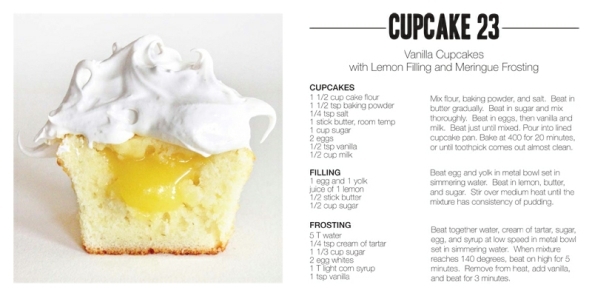 I really wanted to try out a recipe, and from the long list, I picked Cupcake 23: Vanilla cupcakes with Lemon filling (there was no way I was gonna manage the meringue frosting) based on the access to ingredients and my desire to try my hand at whisking a lemon curd. Do you follow all those heart-wrenchingly lovable Masterchef Australia series? If you don’t, you must look them up. In India they are running the Junior Masterchef series, and it makes me feel quite ashamed, really. Am blown away by the sheer talent, technique and palate of the competing kids. Even though I can’t taste a single thing, I can tell how delicious those whip-ups are! Lucy, who is a third generation cake queen and all of 11 years old, was whisking together a lemony yellow lemon curd the other day. And I thought, I must try this someday. Then, along comes Cupcake 23 and I have the chance to get my wish granted. I grabbed it with both hands, put pen to paper and jotted down the recipe in my lil recipe book (thank you Hammie for the Daydreams Nightdreams notebook. It is rapidly filling up at both ends). Here’s a snapshot of what I attempted. If you read on, you’ll pat my back for the delicate choice of words. When I tried my first batch, I wanted to cry. Mine came out too short to even peek above the cupcake wrappers! But they tasted divine. So I decided to give them another go (in any case, the 8 I made vanished before you could say Jack Sparrow and my craving wasn’t done yet). No, I have no amazing story to tell of how I conquered a batch of cupcakes. The second time was only slightly better looking, however, I came nowhere close to the creation above. I bemoaned my ambitious spirit, wondering why I didn’t settle for some bun-butter-sugar (which is my go-to treat in times of sugary cravings) instead. At least that looks neat and edible. But when they taste so good, who cares about how rustic they look, right? My story does have a happy ending after all. The cupcakes came out soft and fluffy, sweet and tangy, and we all lived happily ever after. Not the cupcakes, those were gone and the crumbs were dusted. I urge you to give one of them a go too. They look deceptively difficult, but with a bit of patience, am sure you’ll manage a super yummy set. P.S. You’ll thank me someday for sharing the link with you. P.P.S. Try to send me some, when you try any of them. I have no favourites, or let’s say, they all agree very well with me!